1-to-3 Power Source powering 900 ft deep submersible well pump in northwest Texas. A Written-Pole® single-phase motor can drive a three-phase conventional generator to produce clean, balanced voltage. The proven converter circuit can start multiple smaller 3-phase motors. The 1-to-3 Power Source™ can start a single motor up to about 50% of tis rating, and other smaller motors up to its output rating, thus providing flexibility and cost savings. Because of the high load synchronizing capability of the Written-Pole® drive motor, a large flywheel can be added to greatly improve the motor starting capacity of the three-phase generator. Extending three-phase distribution is expensive, typically between $30K to $110K per mile. Using a 1-to-3 Power Source™ avoids that cost. Utilities often amortize the high cost to extend distribution, charging customers monthly fees whether they use the power or not. Use of a 1-to-3 Power Source™ avoids these charges, which can range from $12K to $60K per year. The highly efficient written-Pole® Motor driving the 1-to-3™ achieves a full load efficiency exceeding 88%, which can reduce energy costs by thousands of dollars each year. Since the 1-to-3™ input runs at unity power factor, there is no power factor penalty, a potentially significant cost avoidance. The 1-to-3™ can replace the diesel or gas engines that are often used as the prime movers for pumps and generator sets. In addition to adding fuel, these engines require significant maintenance and upkeep such as filters, spark plugs, belts, oil changes, and more. The Written-Pole® motor requires very little maintenance in comparison. Aire and noise pollution are also reduced, but most importantly reliability is greatly improved with the 1-to-3™. The 1-to-3™ allows weak single-phase lines to deliver strong thre-phase power with excellent voltage regulation and precise 60 Hz frequency. The generator output voltage provides well-balanced three-phase power capable of staring and running large three-phase motors and power quality-sensitive electronic controls. This equipment isolates the application (and the utility) from harmonics that are harmful to sensitive loads. Written-Pole® motors start using only 1.7x their rated running current. This eliminates the excess voltage sag or “flicker” that can cause problems on distribution lines. The efficiency rating of the motor is 95.5% and the generator efficiency is 93.5%, resulting in an overall efficiency of 89% with 10% electrical isolation. With the 1-to-3 Power Source™ customers served by single-phase lines can get high-quality power for three-phase applications. Unlike conventional phase converters, the 1-to-3™ provides true, balanced, three-phase power eliminates disruptive harmonic feedback, is a unity power factor load to the utility, and with an added flywheel, can ride through momentary power interruptions with ease. Single Phase Power Solutions manufactures the world’s only large horsepower single-phase motor. 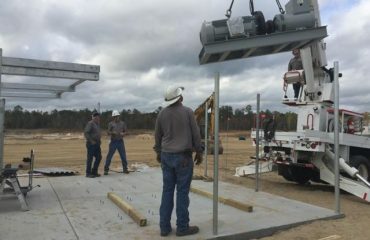 Their patented Written-Pole® technology delivers a robust and reliable solution for agricultural, industrial, municipal, oil & gas, and emerging market applications that need large horsepower output but only have access to a single-phase power line. 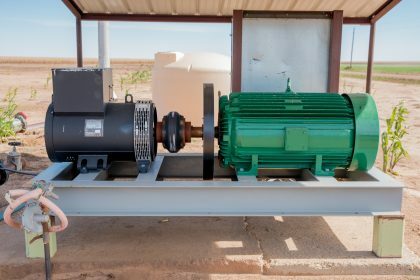 They manufacture a full range of Belle Motors™ up to 100 HP as well as their 1-to-3 Microgrid that generates three-phase power from a single-phase line. 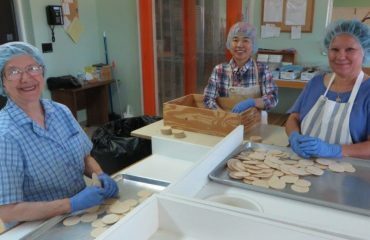 The BELLE 1-to-3 Three-Phase Microgrid helps the nuns of Santa Rita Abby make altar breads.